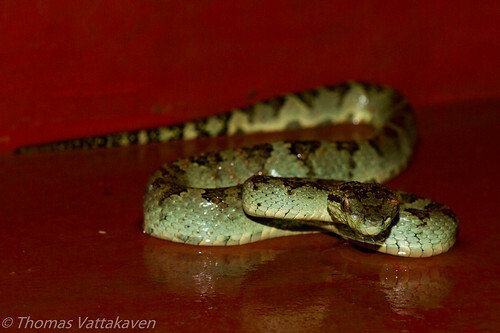 The Malabar Pit Viper (Trimeresurus malabaricus) is also sometimes referred to as the Rock viper or the Malabar rock pitviper. 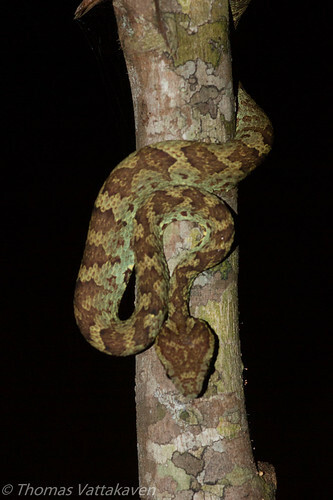 It is a venomous species of snake belonging to the Crotalinae or the pit viper family. The Crotalinae are characterised by the presence of a triangular head and heat-sensing pit organs located between the eye and the nostril on either side of the head. The pits are openings to a pair of very sensitive infrared detecting organs, which helps them to find the small warm-blooded prey on which they feed. 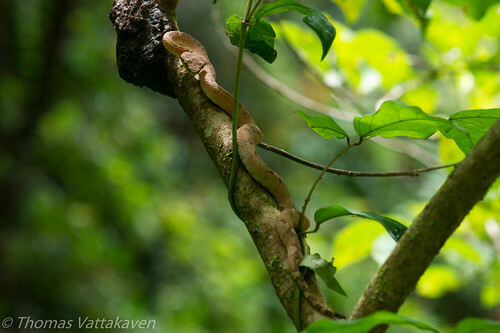 They are found in Southwest India in the Western Ghats between elevations of 600-2000 m and are typically abundant during the monsoon season. 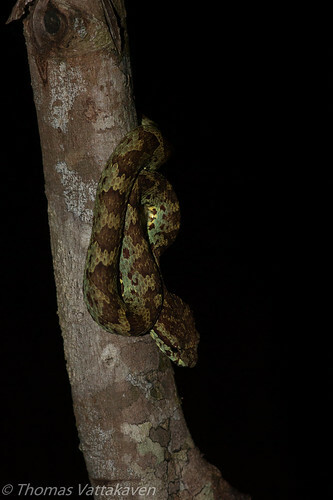 These snakes are mostly nocturnal, preferring to find a cool spot where the bask during the day time. The chosen spot is usually a favourite to which it returns day after day. Even though they become active at night, they are by nature ambush predators, and will wait patiently for the prey to come to it rather than stalk the prey. Once the prey is near enough, the snake strikes with alarming speed and injects its venom. 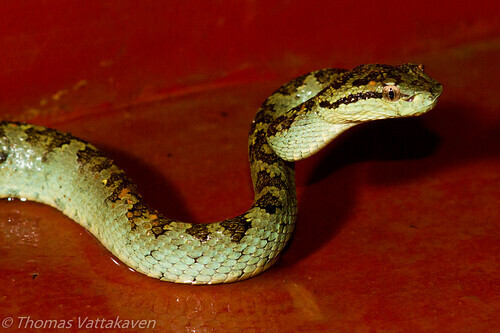 The bite of this snake is generally not life-threatening. The venom may cause pain and swelling but is known to subside after a day or two. The reason for this may be the small doses of venom injected per bite. However, the bite may be more dangerous in children. 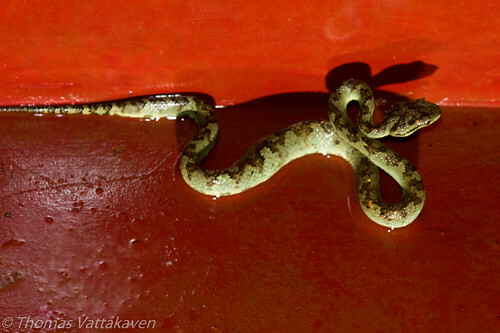 Several colour morphs are commonly observed in this species, including yellow, green and brown. The reasons for the different morphs and their contributions to its ecology are unknown. 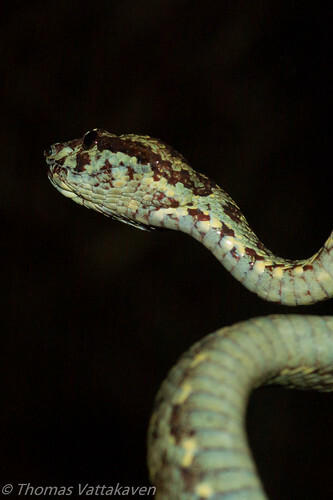 These pit-vipers are egg-laying and are thought to engage in guarding their eggs as well. 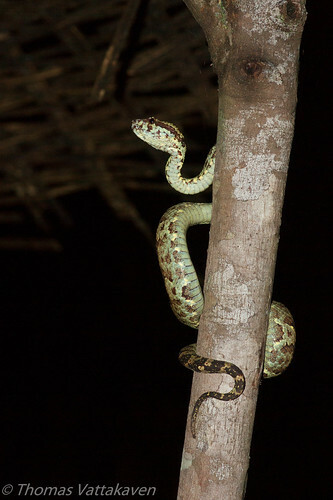 Very little is known about the ecology of this species and more studies are required to uncover the habits of this snake. 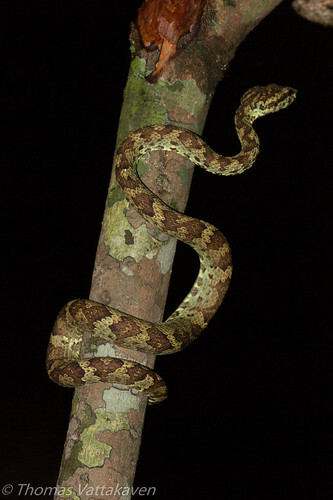 Other Details: The pictured images are of three different individuals from three locations within Agumbe Rainforest Research Station.